Some people are born to get ahead of everyone else. They can’t help it; it’s not their fault they seize opportunity faster than everyone else. This is the kind of person Hume Cronyn portrays in The Cross of Lorraine (1944), a WWII war drama about French prisoners in a German military prison camp. The film stars Jean-Pierre Aumont and Gene Kelly as two Frenchmen taken prisoner shortly after German occupation. The pair become friends despite their philosophical bents: Aumont is tempted by opportunities given to those who cooperate with Germans; Kelly, on the other hand, hates the Nazis and undermines them in every way possible. Cronyn, however, isn’t one to agonize over ethics when it comes to Nazis. Early in the film, we learn Cronyn is a successful wine salesman who has several German customers. But, as he sees it, money is money. Why should he discriminate? If anything, he’s the victim! Is it his fault he has a good product that people want to buy? When the prisoners disembark at the camp, officials ask for a translator. Our man Cronyn steps forward and and offers his help with registering prisoners. (Is it his fault he’s fluent in German?) He’s not translator for more than two minutes before he starts acting in a brash and superior manner. He asks for peoples’ names even though he knows who they are. Cronyn is perfect in the role of the weaselly stool pigeon. He’s cocky and smug as he struts around the barracks. “This isn’t so bad,” he says cheerfully, with clean face and uniform. “Things could be a whole lot worse.” His fellow Frenchmen, haggard and dishevelled, respond with icy silence. We dislike Cronyn’s character, but we admire the actor’s ability to play such a distasteful person. In one scene, he tells a starving prisoner, “You really want to know what I eat? Soup. Real vegetable soup. Sometimes with a piece of meat in it!” But this braggadocio is no minor quirk. We soon learn how dangerous he can be. In one of the film’s darker scenes, a man is shot while escaping and is left hanging on the prison fence like windblown laundry. The priest (Cedric Hardwicke) and the other prisoners decide to hold a makeshift funeral service for the man, even though religious services are forbidden. Cronyn makes a special effort to remind Hardwicke of this regulation. He’d hate to see harm come to the priest. After all, Cronyn is a decent fellow at heart. The men gather for the funeral, pretending to boil weeds so they won’t catch the guards’ or Cronyn’s eye. But Cronyn decides to stroll through his fellow prisoners, trying to sniff out their plan, even though they refuse to talk to him. (Is it his fault camp officials want to know everything that goes on? He doesn’t make the rules, for pete sake!) When he hurries to fetch the guards, Harwicke begins the funeral service and does not not stop – not even when the guards arrive and execute him. The Cross of Lorraine is a gritty war film with performances that wrenches your heart. Hume Cronyn, above all, is perfect as a man who’s a victim of his own cleverness. The Cross of Lorraine: starring Jean-Pierre Aumont, Gene Kelly, Cedric Harwicke. Directed by Tay Garnett. Written by Michael Kanin, Ring Lardner Jr., Alexander Esway, Robert D. Andrews. Metro-Goldwyin-Mayer Corp., 1944, B&W,90 mins. Great review. Haven’t seen this film but it sounds good. Hume Cronyn is such a good actor. He is utterly different in THE SEVENTH CROSS set in Germany in the 1930s – he’s warm and sympathetic ( his real life wife,Jessica Tandy plays his wife in the film. I love Hume Cronyn in everything, and he is wonderful in “The Seventh Cross”. I found him to be quite inspiring. Your comment makes me want to see that film again. One of my preferred WWII films (I wouldn’t go as far to say I had a favourite!) and always a treat to see Kelly in a dramatic role. His contained emotions seem so genuine, I particularly like the scene where Peter Lorre kicks him in the face, it feels so real. According to my dad, there’s a scene in Stalag 17 that pays homage to this movie, although I’m yet to see the latter! Gene Kelly breaks your heart in this film, doesn’t he? He almost makes me cry. There is so much so say about this film that I couldn’t fit it all in one post. Thanks for the tip re: “Stalag 17”. It’s been a few years since I’ve seen that movie, and I’ll have to watch it again. Hi, I just watched this movie and enjoyed it. 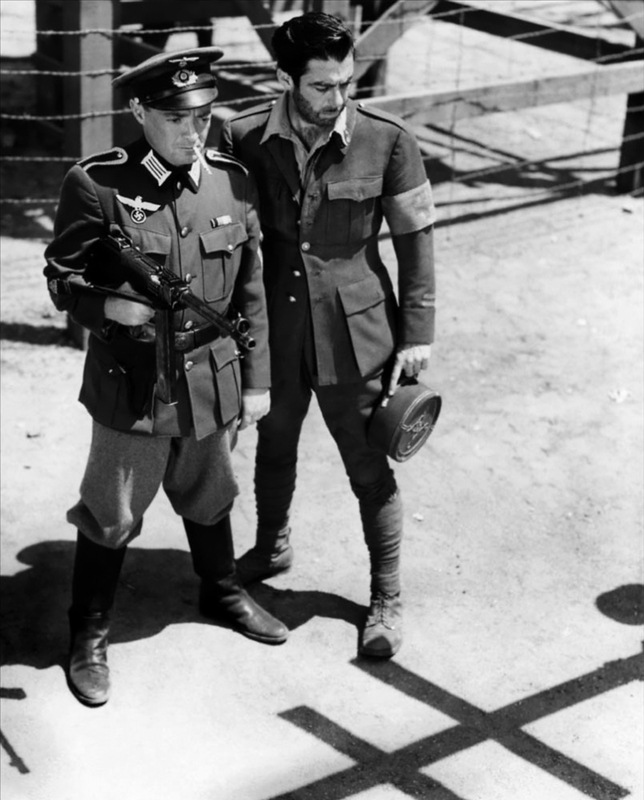 I was reminded of Stalag 17 (one of my favorite movies) many times while watching it. One scene in particular is very similar and makes me wonder is the writers of Stalag 17 were inspired by that scene. 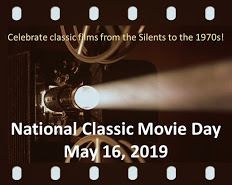 Even though it’s been a long time since I’ve seen “Stalag 17”, I wondered about that as well. Will have to investigate. Thanks for dropping by! Ruth, we’ve been fans of both Hume Cronyn and his wife and frequent co-star Jessica Tandy, riveted in his good-guy roles (The Seventh Cross) and villains (Brute Force). That husband-and-wife team two could do no wrong! By the way, STALAG 17 has been a longtime favorite here at Team Bartilucci HQ, too! You did a great job with such wry quips as: “He’d hate to see harm come to the priest. After all, Cronyn is a decent fellow at heart.” BRAVA to you for your excellent post, my friend, as always! Thanks, Dor! I know Cronyn was in plenty of good movies, but not nearly enough movies for my liking. He was SUCH a good actor and was incredibly believable in any role. I’m looking forward to your Fabulous 50s blogathon post! Beaucoup thanks, my friend, for your great post for THE CROSS OF LORRAINE! I’m also tickled that you’re looking forward to my entry for the CMBA, the 1955 remake of Alfred Hitchcock’s THE MAN WHO KNEW TOO MUCH. Nothing’s more terrifying than a beloved child in peril (not that it’s ever happened to us or our own loved ones, thank God), but Hitchcock knew how to balance fear, parental anguish, suspense, and dark comedy to make a socko movie; thank goodness it’s only a movie! 🙂 We hope you and the gang will be rocked with suspense in the best possible ways! Warmest wishes to you and yours from all of us here at Team Bartilucci HQ! Kelly was equally good doing drama and musicals. His performance in Inherit The Wind is one of my favorites. Kelly really was an incredible dramatic actor, wasn’t he? He’s great in “Inherit the Wind”. He could hold his own against ol’ Spencer T.
Oh I can’t help but think of this quote when watching Cronyn’s character in this movie. It kind of fits today’s time perfectly. Great post! I watched this movie only because of Gene Kelly, but ended up liking it very much. As for Hume – he makes everything just a little better just by showing up, doesn’t he? Hume really does make every movie better just by showing up. Gene Kelly does, too! There’s a lot to like – and say – about this film. When I saw it for the first time, I was blown away. Great post as always, Ruth! I’m intrigued by your write-up and have never seen The Cross of Lorraine! Gasp! You haven’t seen it?! Aurora, you must – MUST – see this one. I’d be interested to hear your thoughts. This one is really heartbreaking stuff. I’ve been watching tons of WWI and WWII movies, this being the 100-year of the start of WWI, and I’ve yet to have the heart to watch this one again. I saw it on a big screen in a town in which I used to live, as part of a too-short “old film” series, and it took me a long time to walk the ten block to my apartment. Thanks for the reminder…gotta get to it! You need a long time between screenings, no? I can’t imagine seeing it on the big screen. It would almost be too much. Wow, this movie sounds heart-wrenching! I would still like to see it though. I have always liked Hume Cronyn. I love how you characterized his personality by saying, “Is it his fault if….” It really helps you see how he rationalizes his behavior. Thanks for a great recommendation and post, Ruth! This is a heartbreaking movie. Gene Kelly’s performance is mesmerizing. This film is definitely worth watching, but you have to be in the mood.